It’s been a while but I’m back! I’ve been secretly tackling our next home project. It’s going to be a big one but before I get back into my usual weekly updates, I have something a little different I wanted to share with you today. This one is geared to all the parents out there. I was recently gifted the most wonderful braided crib bumper from Juju & Jake. This small business created by Agnes, a mother of two, recently stumbled upon her new business venture while on maternity leave with her son. 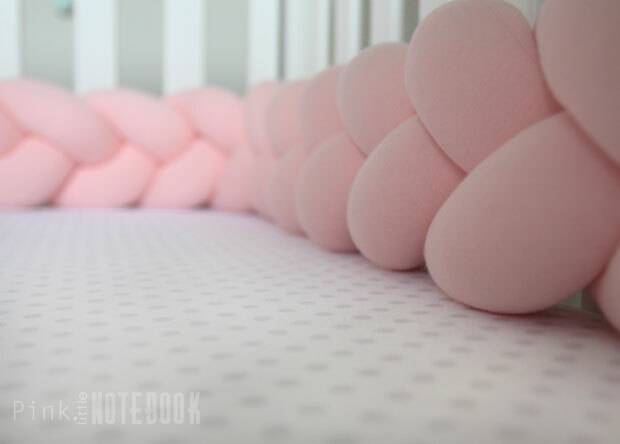 She creates the most amazing handmade, customizable, braided crib bumpers and knot pillow products. Now being a mother myself, who likes to decorate spaces, I was instantly sold by just the look of these bumpers. I mean come on—it’s fun, it’s cute, it’s stylish and what I love most, it’s totally unique! This isn’t a product that you’ll find in your local baby store. After trying this crib bumper out for myself, I just had to share it with you guys. I truly think Juju & Jake has something really special to offer and I wouldn’t be surprised if this braided bumper becomes the next trending must-have nursery item. Now let me tell you about my daughter Olivia. She is what I like to refer to as “The Headbanger” sleep type. Most nights, I can hear her slide and wiggle her way around the crib, usually waking up mid-way through, crying because she just slammed her head into the crib slats. For most parents in my particular situation, a crib bumper is a must for survival. When I received our new bumper, I could really see and feel the quality as soon as I opened the box. This braided bumper is made of a high quality cotton blend with a 100% hypoallergenic filing. It’s cushiony enough to save every single headbutt Olivia has been throwing its way and unlike a traditional crib bumper, the braided technique also allows for unrestricted airflow. When it came to keeping the bumper in place, matching fabric ties were provided. I actually liked the freedom to strategically place them around the crib. I can’t tell you how much I dislike pre-attached ties that never match up to your crib slats. It always throws my need for symmetry off. Most importantly, I like the safety aspect of it all. I’m able to attach the ties to the middle of the braid where it’s out of sight and out of reach. Another benefit I really like about this braided bumper is the height. If Olivia steps on it, (which at her age she always does), it does not act like a booster to help her climb over her crib. Instead, with the plushness of the bumper, it just flattens right down with her weight. 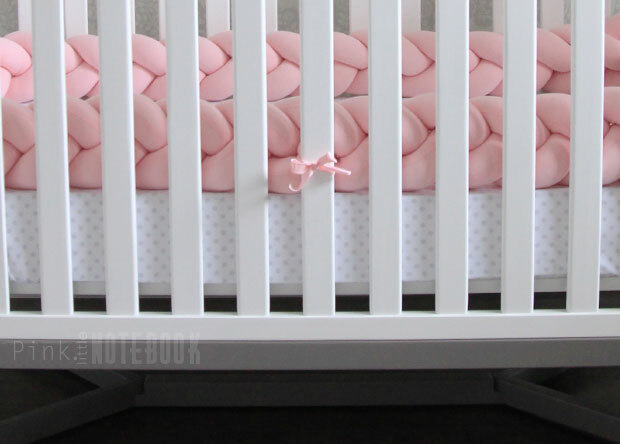 The braided crib bumper shown here is the full crib size version in pastel pink. Juju & Jake offers a variety of sizes, colours and customizations. You can even mix and match colours to accommodate your nursery decor. Maintenance is easy. Spot clean or machine wash on delicate cycle. I literally threw my bumper over my staircase and just let it hang to air dry. 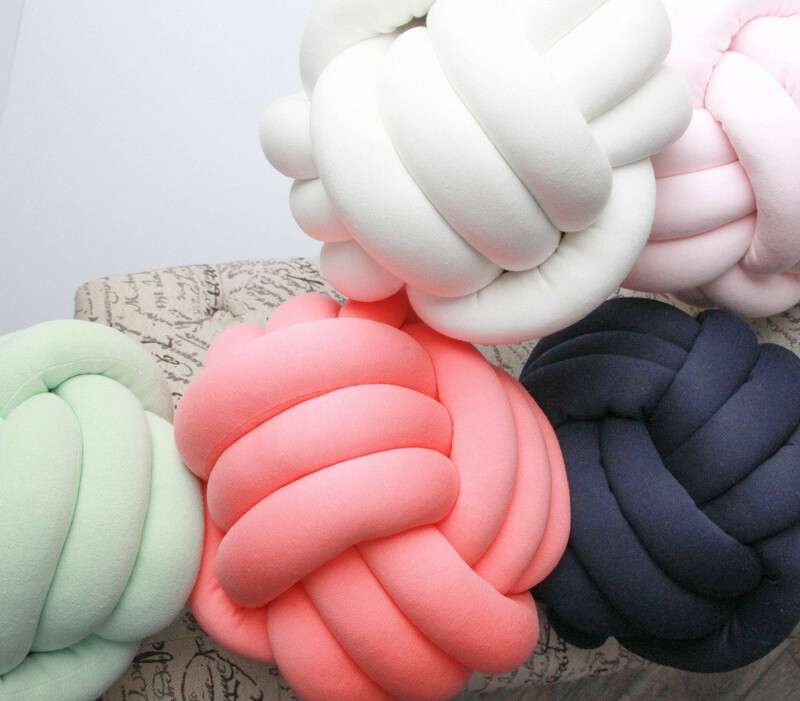 The sphere knot cushions are amazing too. I think they make super cute gift ideas especially for that hard to shop for mom! Just add their child’s name to the cushion and, voilà, you just got a one-of-a-kind gift. If you haven’t already check out Juju & Jake, do so! Agnes’ products and rave reviews truly speak for themselves. You can find more of Juju & Jake on her Etsy Store, Instagram and Facebook page. Olivia is so adorable! She is getting big. 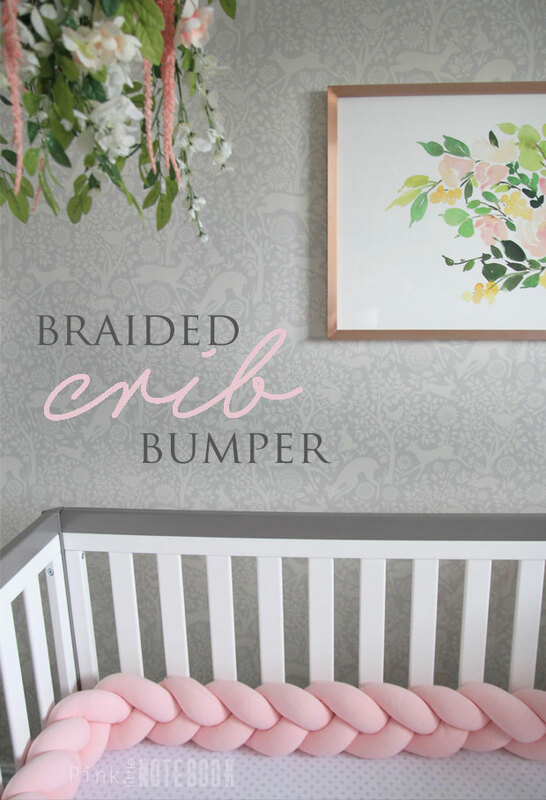 The braided crib bumper is a great product. She seems to like it on the photos, does she? Hi Gabriela, oh she loves it! She cuddles right into it when she sleeps. Hope all is well! I wish I have a baby girl. I would like to try this one. so cute. I’m sure she will love it just like baby cutie Olivia! Where can i get one? I Love it! Hi Sebastian, the link for the crib bumper is at the beginning of the post. It will direct you right to the Juju & Jake store. Hi Barb, the link for the crib bumper is at the beginning of the post. It will direct you right to the Juju & Jake store. Like most moms, I read a lot about SIDS and the fact that the AAP recommends to not use bumpers… but I also ended up having a ‘Headbanger’ sleep style too! This wakes up my 8 months old baby girl really often, so I’m trying to find something that’ll be both cute but mostly secure for my child. What are your thoughts on that braided crib bumper? Totally cute, but is it secure enough — I know you stated a few things to prove your point, but I’m really just looking for more selling arguments for my spouse since he wouldn’t let me spend 125$ on a bumper if it isn’t safe..! I totally feel you and bumpers are definitely a controversial thing for many parents. I too read so much about SIDS which is why I didn’t use one before 6 months. However, my daughter was fully mobile by the time I put a bumper in her crib so I was comfortable with the fact that she could move herself freely if she got in an awkward position. She pretty much falls asleep with her face in the bumper but she doesn’t stay in one place very long. I can’t tell you how much better her sleep is. She doesn’t wake up every 20 minutes anymore! Bonus for me too! All the best in your decision making! Were can I get one and how much is it. Good day I am from South Africa and would like to know if there is a diy available in this, as shipping to SA would be too costly. This is soooo cute! Have to get one for my daughter. Thanks for sharing! Where did you dind the framed art hanging on the wall behind her crib? I began to make one of my own, but can’t figure out how to get the batting in the fabric “tube” any suggestions? I’ve seen before where (for a knot pillow) some kids scrunched up the fabric over a paper towel tube and used a dowel rod to stuff the stuffing down the tube, and into the fabric. Then unscrunched it as it filled up. Good luck! I’m thinking about this for my little (who is just beginning to spend ANY time in his crib at 6 months lol!). I love everything, it’s cute, and I feel like it’s more breathable than most. My only question is how secure is it? Little bit grabs and pulls EVERYTHING so I’m worried maybe he’ll pull one strand and it will bunch away from the rest and they’ll get all messed up? Hopefully you can help! Do you know by any chance what these are made of?